When I taught second grade, our class made some nifty chalk drawings on the sidewalk near our school. 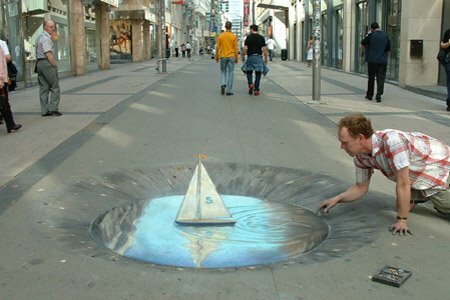 These unbelievable pictures by Julian Beever show what a little chalk on a sidewalk can do. I still think that sidewalk chalk-art is good material for an art lesson. Kids of all ages love playing with chalk.